Visit us at the Sign & Digital UK 2019 exhibition from April 2 to 4 (Birmingham). 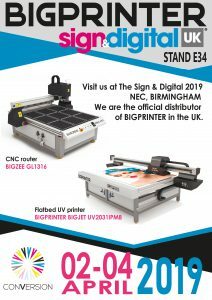 Sign & Digital UK is the largest British visual communications exhibition organized for manufacturers and suppliers of signage, signage manufacturing equipment, technology, and materials. The exhibition of printing technologies and digital equipment traditionally allows the visitors to see the entire spectrum of the printing industry in one place, compare prices of suppliers and the quality of devices. The BIGPRINTER BIGJET 2031iPM8 flatbed UV printer and the BIGZEE GL 1316 CNC router will be presented at the stand of our dealer CONVERSION. You will find us at stand E34.